Rock legend Queen are set to play Galaxie in Amneville on Sunday November 12 for concert organised by Luxembourg’s den Atelier. 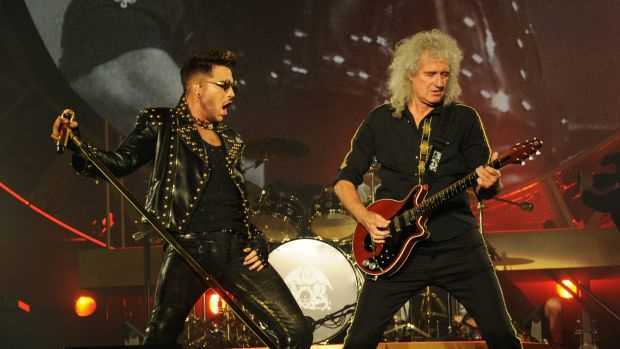 Adam Lambert, who rose to fame as a contestant on American Idol has taken over vocal responsibilities with the band for the last five years and in an exclusive interview, he took some time to tell Sam Steen about the tour and what it’s like filling in for an icon like Freddie Mercury. Since finishing second on American Idol in 2009, Adam Lambert has sold over three million albums, a further five million singles as a solo artist and has been nominated for a Grammy for Best Male Pop Vocal Performance. That would seem like a successful career in it’s own right but going through American Idol has also given the singer from Indiana an incredibly unique opportunity that would never have happened were it not for his appearance on the show. "I performed Bohemian Rhapsody for my audition and Queen became aware of me over the course of my run on the show and then were invited to come on the Finale and play." They kept in touch as Adam toured his debut album and then they reached out for him to perform with them. "We did the MTV VMA awards, they invited me to come and sing a medley with them. That was the first gig and then I was invited back again not too long after that and we started doing some gigs out in Eastern Europe. We did some stadiums and then went to London where we did a couple of shows at the Hammersmith and it was well received so a year later we got together and did a big performance for I Heart Radio in Las Vegas and it got such an amazing reaction that we decided to put together a tour." While no stranger to playing in front of large audiences Adam admitted that fronting a band like Queen was a very different proposition. "It was very daunting" he said, "you know, not only did I want to do a great job and please Roger and Brian but I know there are so many fans out there, of this legendary band and I knew that the pressure was on and living up to their expectations, especially after Freddie, is a lot to ask." Lambert is an incredibly talented and versatile vocalist, he would have to be to sing some of these songs, and working out how to approach the material has been the key to his success with the band. "I figured out pretty early on that if I focussed on the message of the songs and the feeling of the songs that everything would fall into place and I had to trust my instincts on that", he said. "Obviously there’s a fine line between paying homage to Freddie and the work that he did with the band in creating these songs and figuring out a way to not imitate him at the same time." "The thing is, Freddie was absolutely amazing, I mean, he was incredible and if I sat there and was comparing myself with him over and over again I would be a mess!" he said with a laugh, adding, "obviously the audience who are coming to see us, this is the band they fell in love with, these are the recordings that they know and love, so it’s tricky. It’s a balancing act. You want to pay respect to that and honour the memory of the band and honour the memories that fans have of the songs because people have grown up with the songs and they’ve been in their lives for years." Adam is a bona fide pop star with a string of acting and television credits to his name. There’s no doubting his celebrity credentials but even he knows that Queen are on another level. "Queen are royalty right? They’re from the heyday, the golden era of music when you could make lots of money, like, LOTS of money", he said. "I joke about it with my friends, we do it first class style with Queen. We travel by jet, there’s a chef. These guys are legends and they get treated a certain way and I get to tag along and then when I do the solo tour it’s back on the bus and no more chef we’ve got to go pick up food, it’s much more humbling really. I feel spoiled by it." And that sense of gratitude extends to the performances as well, you get the impression that Adam is having the time of his life touring with Queen. "It’s the best gig ever because I get up on stage and perform these songs where everybody knows all the words, they know all the songs and there’s just an instant connection for everybody. There’s no other gig like it." he revealed. "It’s even different to doing my own stuff. You know if I go on my solo tours with my own music a lot of people don’t know every song, they might know the hits that have been on the radio but this one, and we do all the hits, with all the popular songs it’s amazing." This is the second tour that Adam has done with Queen and he says that this time it’s even bigger and better than the last. "For anyone that saw our last tour in Europe, this time it’s completely different. We reimagined the stage and the design. Obviously we still have all the hit songs but we’ve put them in a different order and done certain things differently, we’ve given them different visual contexts and added a couple of songs that we haven’t done before." concluded Lambert. Queen fans have a lot to look forward to next week. Lambert will never be Freddie Mercury but he never tries to be, he’s just an exceptional singer, playing with one of the biggest bands of all time, performing their greatest songs. What’s not to like?